Do you remember my posts proclaiming my love for this cardigan? Well, there is some good new and some bad news. The good news is that this little lady is on sale. The bad news is that J.Crew was running a 20% off promo that ended yesterday! Talk about bad timing. I am considering taking the plunge anyway. What do you think? Is this price drop enough to get you to buy? Leave your thoughts below. just fyi - it just dropped down to 29.99! Thats a good deal! i think i could take a plane cardi and do the same thing! 40$ is too much for a sweater...no matter how cute it is. 30$ is more reasonable. But I agree with Courtney, you could easily make one and it would be half the price. No way. I spend $15 max on cardis. I guess that makes me uber UBER cheap! I think I'd rather DIY this look, since it's still thirty dollars. I love my cheapies and I want to keep it that way. I do LOVE the sweater, though, but I'm always lusting after things I can't have. So I make them instead! i would totally get it! i am too lazy to try to recreate it!! take the plunge!! I say take the plunge! It's beautiful, the color and detail. I might have to go get one for myself. 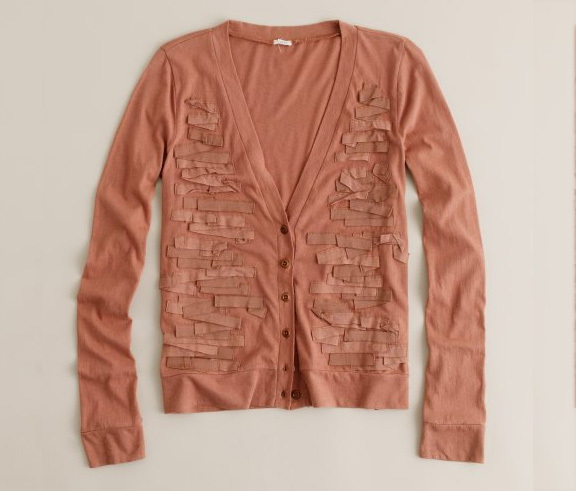 This is such a pretty color cardi! But I don't think I can bring myself to spend $30 on a cardi. Maybe $25 MAX. Dang, I am cheap! For the quality of J Crew, it's a great price. Try calling the outlet with the style number and see what their price is, if it's till more than you are willing to spend.